This enormous and beautiful library belongs to Karl Lagerfeld, proving that celebrities can be bookworms too! A follower and friend of Vignette Design sent me these photos since I have been on the subject of books lately. 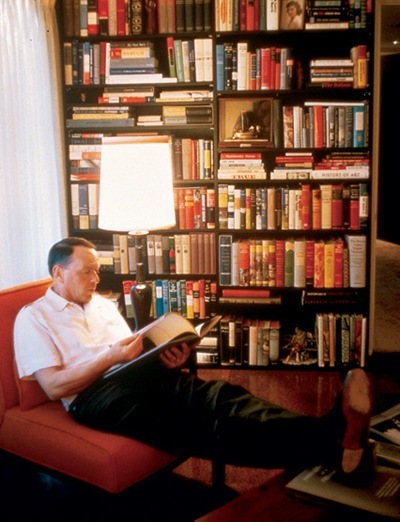 I love this photo of Frank Sinatra enjoying a good book in his library. 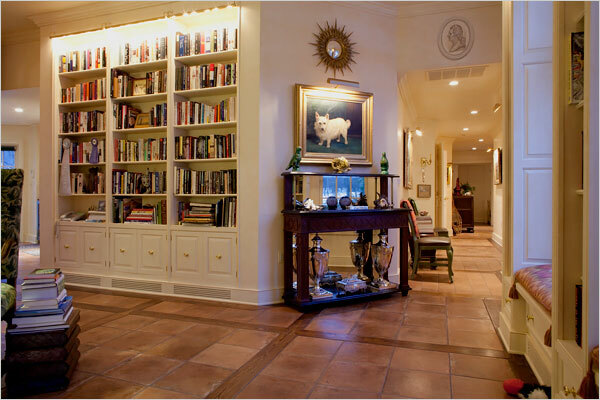 Of course, Oprah has a beautiful library! Diane Keaton's is very interesting, don't you think? This is Woody Allen's library. I would love to sneak a peek at what is on his book shelves! Greta Garbo's looks like it is just for show. 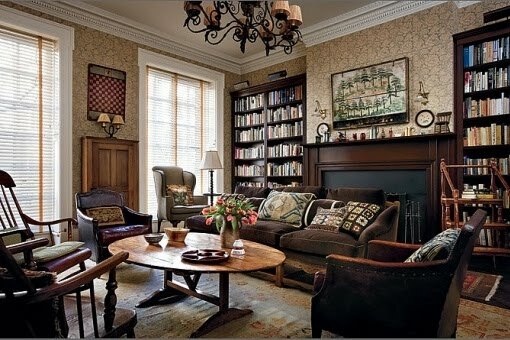 My favorite celebrity library though is Jimmy Stewart's. Just gorgeous! I don't think I would ever leave this room! Oh what a great 'Come Back' on this favorite subject! Wish the lamp was not in the way for the saying in bold print on the wall above the book shelves but I guess it says: THE - MIND - KNOWS - THE - EYE - SEES. My favorite is that of Jimmy Stewart because it looks WELL READ! Not just placed there for looks alone. My VERY FAVORITE is definitely Jimmy Stewart's AND "Is that possibly a Stuffed Harvey I see resting on the back of the couch on the left??? Jimmy's.....love it that Harvey made it in the picture. Oprah's is way too tidy. Delores, I'm following the crowd - jimmy's is my favorite! The shelves look as if the books are well read and loved. I could cuddle up in that sofa for hours with a good book. 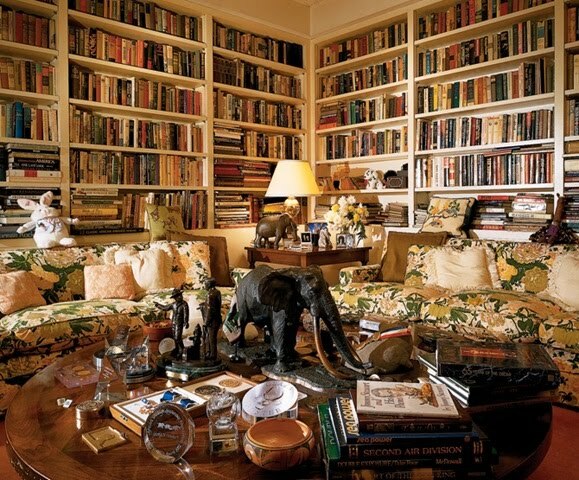 I like Jimmy Stewart's too, but I have to say, I'm pretty fond of Joan River's library as well. What a collection of libraries! my favourites must be Diane Keaton's with the arty mural like sign and Jimmy Stewart's! Both have a feeling of warmth and welcome! In spite of the size of Jimmy Stewart's library, it still has a lot of warmth and the books look like they are being used. And I do like Oprah's. I doubt that she has much time to sit and enjoy the room though! 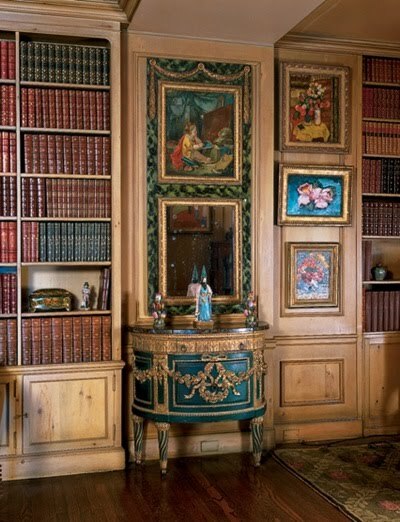 They are all stunning, so many try and hide their books - or just do not know how to display them. Is that Jimmy or Rod Steward? Your tablescape back in December with the tartan plaid and using books was gorgeous. Jimmy Stewart's looks quite comfy and lived in, but I like Woody Allen's look, too. It looks like I'm in the minority, but my favorite is Woody Allen's. It looks so NORMAL! I'm suprised, wasn't what I was expecting from Woody but it looks like a room I would like in my own home. 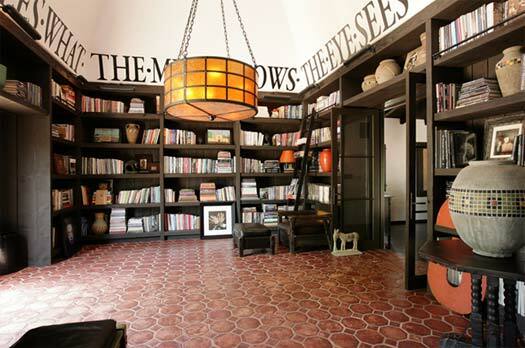 I do like the word mural in Diane Keaton's library too. Great posts on a great subject this week. Jimmy Stewart of course. My favorite all time actor that ever lived. Would love to curl up his couch and read some of his favorite books. The one on his coffee table front center is "Jimmy Stewart and His Poems". I am fortunate enough to have a signed copy. 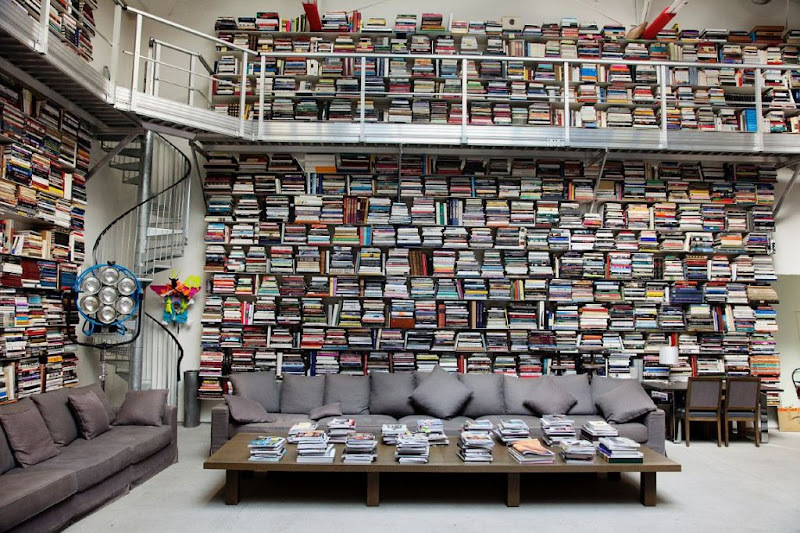 LOVE Woody Allen's library -- and Stewart's is a close second. Love the stuffed rabbit -- Harvey! I love libraries that look random and read, not ones with rows of matching books, like Garbo's and Oprah's. Oh wowser - you had me drooling all over my keyboard! That first one - Karls is amazing! But I'd say for comfort and beauty it would have to be Jimmy Stewarts. My favorite, hands down, is Woody Allen! 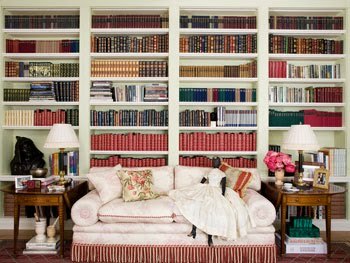 I love Jimmy Stewart's library too, but my favorite is Diane Keaton's beautiful space. And I don't think it's just the room that attracts me, I think among the books on her shelves, more than any of the others, would be ones I would love to curl up with and read! All your postings on libraries and books have been a feast for the eyes (though I would never tear a cover off of a book OR glue the pages together for a decoration). Like most others, Jimmy Stewart's is fabulous. Comfy and lived. I like Woody Allen's as well. HA! Looks like the stuffing is coming out of the sofa. I'd say the room is well-used. Oh, they are all so beautiful. But I think I'm with you on Jimmy Stewart's. I love Jimmy Stewart's too...I have his poetry book which is on the top of the table closest to our eye..it's white...he read some of them on Johnny Carson and brought the audience to tears about his dog Beau..
Oh My heart! Jimmy Stewart...just when you thought he couldn't get any better! Jimmy Stewarts ,the books lookas though they have actually been ready ,plus I love the saying printed at the top of Diane Keatons ,I my borrow this for my office! Jimmy Stewarts. Perfect spot to curl up on those cozy couches with a hot cup of tea and a good book. It looks like a comfortable room with a fantastic selection to choose from. I'd have to definitely concur that Jimmy Stewart's is the best. I feel as if he actually read joyfully in there and that I could have walked into his house and plopped down and felt just as amazingly at ease in all of my bibliophile ways in that comfortably elegant space! My pick would be for Frank Sinatra's library! Brought back memories of my childhood. I took clarinet tutoring privately in the comfort of another Junior High teachers home. His instrument of choice, and I gained great skill and technique under his guidance and teaching. Many times, my dad would be caught in traffic coming to pick me up. The instructor would have me wait in his home library at the front of the home. It resembed Frank Sinatra's. I would lisen to classical music and wonder at all the stories contained in those books. I'm sure I gained more than clairnet practice during those lessons. My love of books and classical music lives on in my own home today! I'm REALLY in the minority here, but all those books make me claustrophobic and don't appeal to me at all. Interesting to look at, yes. But I'm a library girl and the books come and go at my house all the time. Sorry, it just seems a little like hoarding to me (you couldn't possibly interested in rereading all those books??) I think of all the dust...dirt...just not my thing! This is my favorite post you've ever done!! I'm going to tweet about it!! I so enjoyed this post! Thank you so much for sharing! I love libraries and books and I am always on the look for inspiring pictures of libraries! Thank you!! For a me, a good library is one where I can actually FIND what I am looking for! Jimmy Stewart, Frank Sinatra, and Woody Allen have wonderfully appealing rooms. But Karl Lagerfeld? You would have to take the place apart looking for whatever book you had in mind! Crazy way to organize. I am with you Jimmy Stewart's! Meet me at Jimmy's! It has such soul! Either Jimmy Stewart's or Oprah's. Lovely! Oh, this is a no-brainer. J. Stewart, by far!! Can't you just see his long, lanky frame, sitting with that cute grin on his face, enjoying a good read. We could see so many great bookshelves, a library or two, just a nook, carved out to enjoy a good book. (2) OPRAH'S & GARBO'S "libraries" are definitely b-o-r-i-n-g & IF they're just for show, it's a b-a-d show!!! (3) DIANE KEATON'S is FAB, and SOOO very much like I would IMAGINE she would have it... It SPEAKS "DIANE" & I LOVE IT!!! (4) Joan RIVERS has a space that simply PROVES that she TALKS more than she READS! (5) And my very DEAREST, MOST BELOVED & WONDERFUL JIMMY STEWART (& it was Gloria's too, obviously) LIBRARY is SOOOO TRULY HONEST and somehow, IMHO, speaks VOLUMES (pardon the pun!) about him/them~ as people AND voracious readers~ and so especially, his interests and what a truly well-read GENTLMAN he was! Gee, that felt good (to be SOOO "honest"!)! THANKS, GIRLFRIEND! Woddy Allen's is my fav. So warm, inviting and traditional feeling. And can't you just imagine what's beyond those gorgeous windows? I imagine the hustle bustle of city life. Yep, Jimmy Stewarts! It's so warm and inviting and the books look like they have really been read and loved. Thanks for becoming a follower on my blog and I'm following you too. Jimmy Stewart's is more my style reality but give me Greta Garbo's just for looks!! Dreamy! Perfect post after the last one..